SSC Exam Centers for Constable GD Their are all India Centers made for conducting SSC 76,500 GD Constable Vacancy 2019 IN WHICH highest number of centers grabbed by UP Government Centers for preparing ssc gd exam successful. SSC GD Constable Exam Timing 2019: In Morning (9 to 10.30 AM), Afternoon 12.30 TO 2.00 and Evening time 4.00 TO 5.30 am allotted for ssc gd constable exam 2019. SSC GD Batch Wise Exam 2019: People who are living in SSC Central State such as MP, Bihar and Uttar Pradesh. They dont need to panic about on they exam may be conducted in SSC GD Constable delhi, SSC GD Constable punjab and andaman nicobar island because of below list. 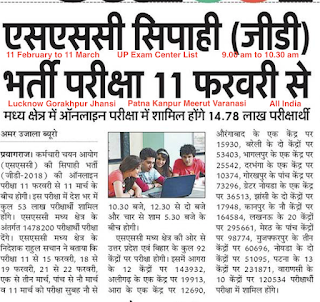 SSC GD Exam Centers list 2019: In Uttar Pradesh and Bihar 92 exam centers were made to hold ssc gd constable bharti pariksha to check this follow below.